You’re thinking about starting up some new affiliate campaigns, so you run your scrapers to see what’s other affiliates out there are doing right now. You see a couple campaigns that you think are easy to replicate, and if other affiliates are running them they must be profitable…right? Easy enough, you hit up your AM for a pay bump, create an almost identical landing page, create almost identical ads, and run that puppy. The affiliate you chose to copy has been running the offer for a while and has a special payout that enables him/her to smoke the competition (this is what happened when at least 50 affiliates used to rip my dating pages). The affiliate is cloaking their landing page from you, so the page you’re taken to isn’t really the landing page they’re running. The affiliate isn’t even making money with their page/offer. The affiliate has optimized his ad targeting, something you wouldn’t be able to see. They were the first one to the party and the first one to think outside the box. While there is money to be made simply copying other people, the most money is made from coming up with your own ideas. It’s just natural that a new style of page or way of selling something can convert better than the norm, simply because it’s something fresh that people aren’t used to seeing. Instead of talking about concepts and theories, once again I’m going to construct this post with an example of thinking outside of the box that I used about 6 months ago. The point isn’t to teach you everything there is to know about thinking outside of the box, it’s to show you an example of it that will hopefully get your creative juices flowing, perhaps enabling you to think outside of the box a bit more with your campaigns. Note: the example I’m going to use didn’t really work out for me, that’s why I’m sharing it. I’m sure you’ve heard it before, but one thing to always remember is that most of your campaigns will fail…especially when you’re thinking outside of the box. For every 5 ideas that don’t work at all, there will be 1 that does work; making everything worth it. 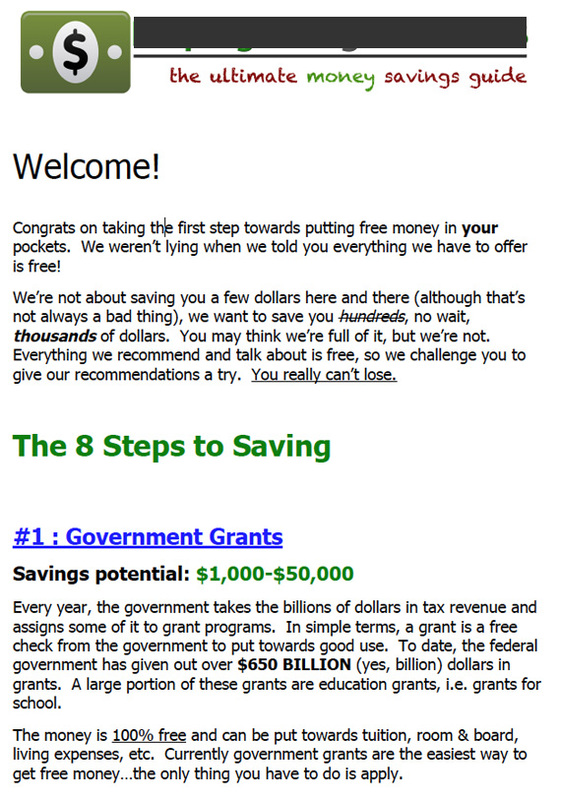 A while back, a lot of affiliate started using a new “outside of the box” method for selling grants. They would collect a persons Name and E-Mail on the first page, bomb them affiliate offers through Aweber, and then after they collected the data would take them to more landing pages pushing grant affiliate offers. I’m not about to out any pages right now, but you’ll be able to see what I mean anyway. The page is simple enough and looks almost exactly like the grant second page did. If this campaign were successful, I probably would have redesigned the page and split tested a few different variations so it was more unique. This is something I designed and threw up in 2 days. 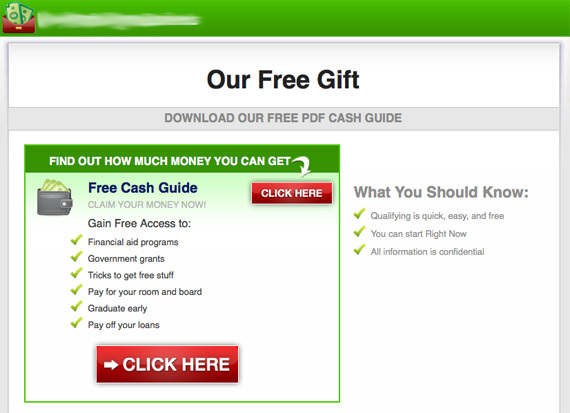 This page is extremely simple and leaves them with only 1 option…to download the free cash guide. Since that’s what they wanted anyway, shouldn’t really lose anybody on this page. When they click the button, a download link would pop up and then the page in the background would redirect to an edu offer. It’s just a PDF loaded with affiliate offers. Surprised? 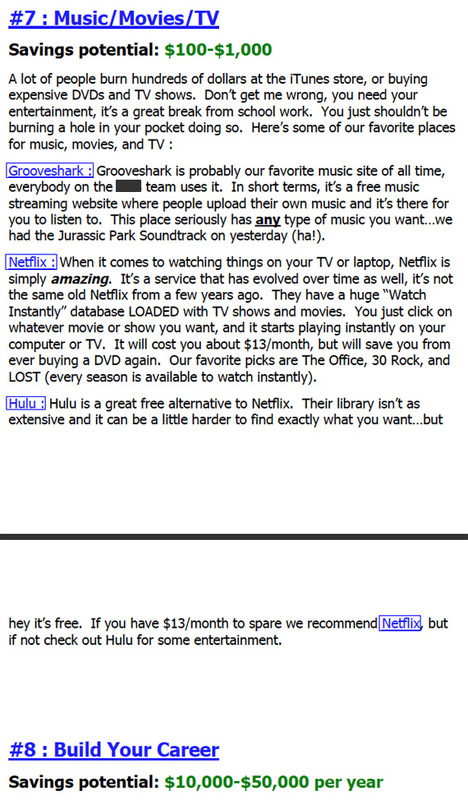 It wasn’t 100% affiliate offers because I wanted to instill as much trust as possible and make the college student feel like they were reading good advice, so I threw in the tip about Grooveshark, Hulu, etc. While it may seem like a shiesty way of doing things, it’s all legit. None of the offers require a credit card (except for the tiny credit report link I threw in there), and they’re all things that students can use to help save some dough. If the students had just picked 1 of the links to follow through with and convert, the campaign could have been very profitable. If they filled out multiple offers? Could have been very very profitable. I had their e-mail too and subscribed them to a list where I sent out mostly edu e-mails. Maybe the PDF seemed too phony? 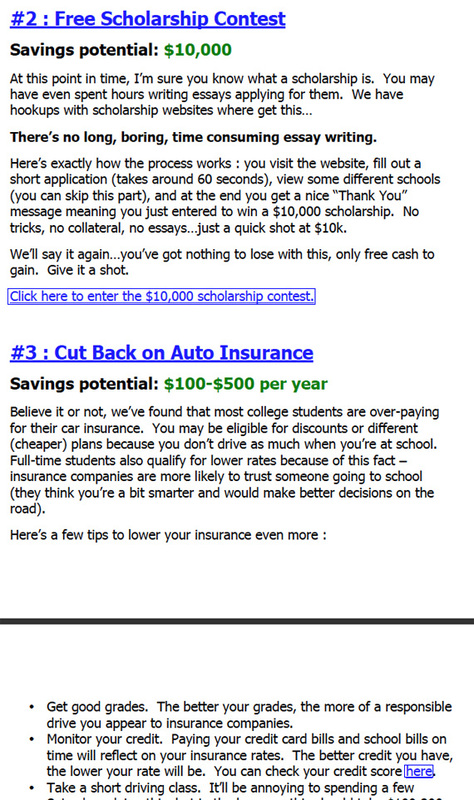 Maybe I should have just pushed all the offers on the next page, instead of e-mailing it to them in a PDF? Maybe I used too many offers and should have focused on 1 or 2? Maybe I wasn’t taking full advantage of the mailing list? Maybe I should have sent the PDF, but done something other than just redirect them to an edu offer after they downloaded? There are many reasons it could have failed, and many things that could possibly make it successful. If I see ads for similar sites up in a few days, I’ll know what I could have done differently ;). Feel free to manipulate the idea and test it out if you want, just be warned that it didn’t work out for me initially. So there’s an example of a way to think outside the box a bit, and push affiliate offers in a different manner than most would. This particular attempt failed, but I’ve done very similar things and have been successful. Are you thinking outside of the box? Or are you just spamming more of the norm? Both have their advantages, but if directly copying other people isn’t working out for you, you might want to start thinking outside of the box more. Wow thats a great idea. Im surprised it didnt work as it looks like it has a lot of potential! Maybe the college student didn’t trust your pdf enough to fill out the offers? You could try giving them free info first for a couple of days, then slowly get in with the offers? That way you have more trust? Have you been drinking lately Paul? The last two posts are amazing and a GREAT read compared to last year. I immediately got some great ideas I could add to my current projects. 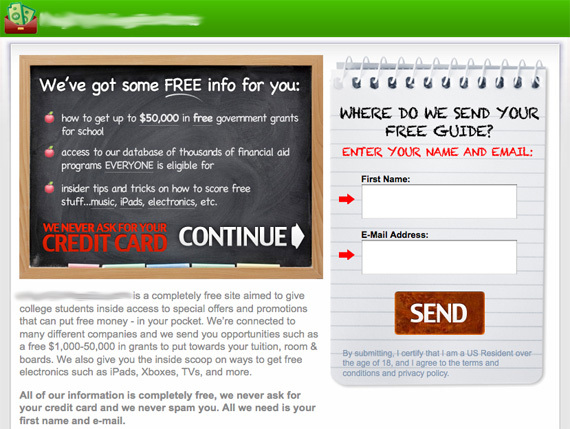 It’s also great to see some landing pages of yours, even if they were not profitable for you. Do you design them in photoshop and convert them to XHTML yourself? This looks like a great idea. Some things that randomly popped into my head were these. Maybe your PDF was too long? Too many choices to save money? Maybe that’s where your email list comes into play. What if you gave them a choice on the PDF download page like if you spend too much on ____ click here. Then another choice and another and each would be a smaller ebook but the same options as your 8. I had this idea as well but never did anything. What traffic sources did you advertise this on? Did you get it on Facebook? Georgia, any time you got a good idea like this just go with it! Cool out of the box thinking. The biggest variable that i think had an affect on the campaign was that you gave them all the offers at once in a PDF. Possibly too time consuming and too many options. My guess would be most people in that demographic would have too short of an attention span to remember the pdf, go check it & follow-through. I know what happens to whitepapers & other pdfs I download. They go into the “I’ll get to that later” pile… which never gets gotten to. I think you’d still send the pdf – why not, but also taking them down a path after submission would be a great test to start with. Reading this article got me to thinking out of the box as to how I could improve my offers. This is a great read and I appreciate you sharing it with us. wow, nice post. I think I just worked out what I was doing wrong on one of my campaigns – expecting too much reading of the visitor. If I were to try what you did, first I’d run the opt in box, give them a thinner version of the pdf. Then do a daily or weekly email focusing on just one offer. Thats about all they read anyway. One at a time could get each individual offer more attention – while if they dont like it and exit … they have only turned down ONE offer not all of them.